Our exclusive set is perfect for teaching children that everyone's family is special and unique! These families help teach diversity and encourage loads of dramatic and imaginative play! Use them with blocks to create a whole community! Build neighborhoods and explore that everyone is important and plays a valuable role! 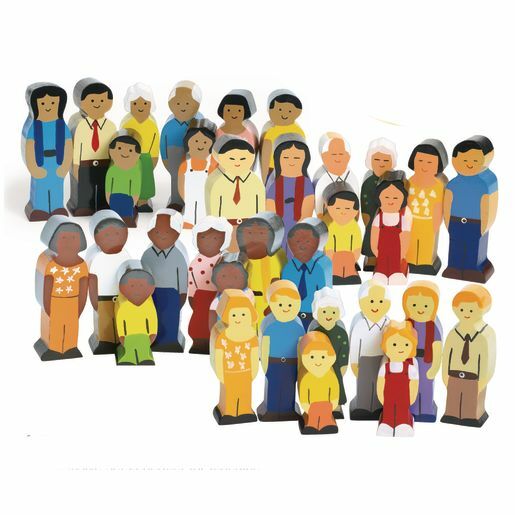 The 32 sturdy solid wood figures are easy to stand up! Hand painted on both sides to represent the front and back of each person! Each set of 8 includes: grandfather, grandmother, mom, dad, big and little sister and big and little brother! Playing with blocks develops gross motor skills!